So back in 2015 I discussed my feelings on how a dress can be shapeless OR long, but not both at the same time (at least on me!). Still, if I find a print I love, I'm probably going to buy it even if it doesn't fit my rules as-is. This dress was another perfect example! 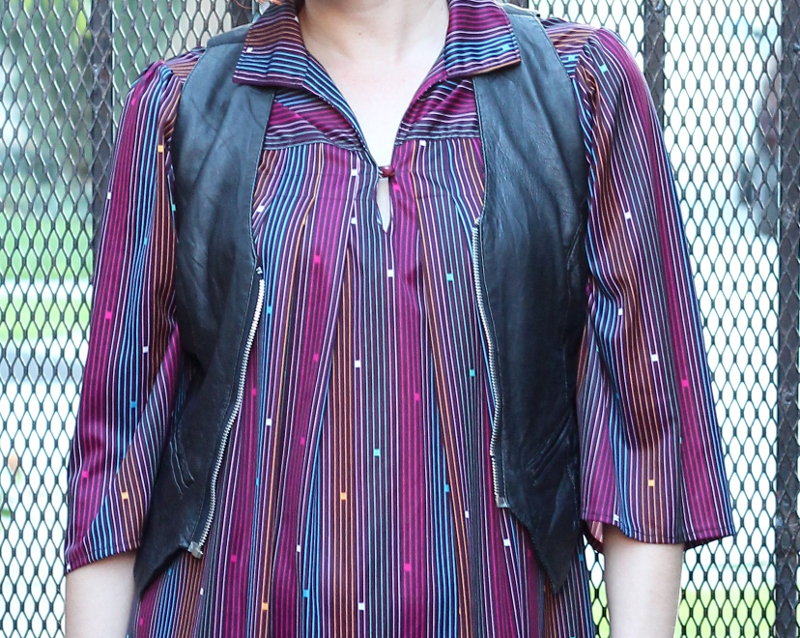 Bold jewel tones like this immediately grab me every time, and the stripe and square print is just so cute! The dress itself had some problems though: long, shapeless, AND weird sleeves. I'm honestly not sure what was up with those sleeves originally. Were they supposed to be full-length long sleeves or were they actually supposed to have the button cuff hit at mid-forearm. I have an ongoing problem with vintage long sleeves being too short on me so it could be either! Regardless, something needed to change. At first I thought about losing the sleeves completely so that I could layer bright blouses underneath, but that would've also involved changing the neckline. I just wasn't up for that (and kind of like the original neckline). So I cut the cuffs off instead! That actually ended up giving me a fairly wide sleeve that makes a lot more sense visually. Then, of course, there was the length. Snip, hem, and done - I have a mini dress! Add bright tights, suede boots, and a leather vest and you've got a bold, colorful outfit!